They opted for a three piece line-up deciding that it was a nasty, pointy shape as opposed to the squareness of a 4 member line-up. Besides, Cream were a 3 piece, and that was enough for them. They recruited former Monochromes member Tim Pickering on bass to complete their power trio. In 2011 they recorded their debut 12” LP Primitive Clockwork at an old morgue specially converted into a studio for the album by former Monochromes frontman JJ Symon. 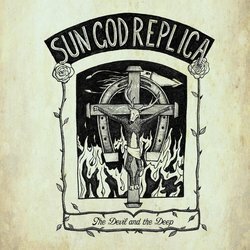 The record received much critical praise but the Sun God Replica boys new they couldn’t rest on their artistic laurels. Not if they wanted to create a Sun God sonic pandemic. Along with engineer Loki Lockwood from Spooky Records they sweated over a hot mixing desk like alchemists over a cauldron and produced The Devil and the Deep; a nugget of rockin’ ‘n riffin’ gold. Werewolves in love is the 1st single taken from the forthcoming album, The Devil and the Deep; a nugget of rockin’ ‘n riffin’ gold.